We have already said a lot about layered navigation, but it is still not enough to cover the topic. That is why today we would like to introduce you to Aheadworks Layered Navigation – another time-proven tool that can substantially improve the default user experience of both Magento 2 and 1. Note that the navigation of Magento 1 and 2 is slightly different, so both modules introduce unique functionality, but still have the same goal. 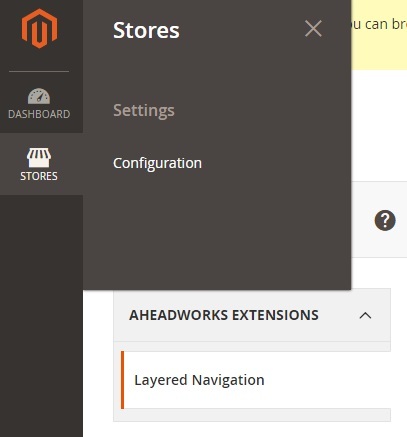 Below, we will pay closer attention to the Aheadworks Layered Navigation Magento 2 extension, but you can also use this review to get a deeper insight into the appropriate Magento 1 module. When you install the Magento 2 Layered Navigation module, it will automatically apply improvements to native navigation. As a Magento admin, you will deal with a straightforward backend interface providing some optional features. The extension allows managing all layered navigation filters from one table grid, as well as specify settings for an individual filter. Thus, the module adds the ability to set automatic sorting for multiple attributes, choose categories where a filter will be available, and decide whether an attribute list should have an expanded or collapsed look. As for the module’s frontend functionality, it eliminates page reloads when your customers apply filters, shows the number of results for each configuration, as well as allows store visitors to decide when they are ready to reload. Possibility to refresh only product catalog without a full page reload is implemented thanks to the fast AJAX navigation. 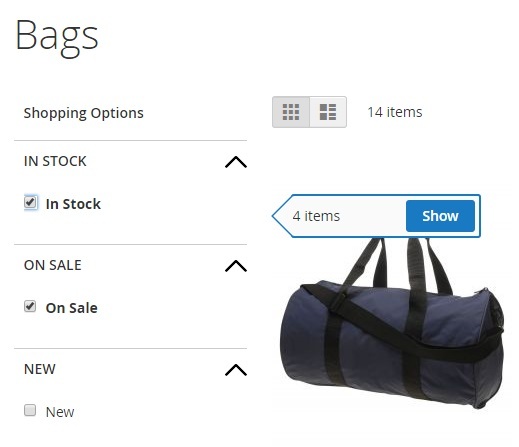 Besides, the AheadWorks Layered Navigation Magento 2 extension adds new filters, so product selection may be easily narrowed down to show discounted, new, or in-stock items, as well as products within a specified price range. Another great feature is the attribute multi-select: several attributes of the same filter may be selected simultaneously. This feature is not possible on the default Magento platform, so, with the Layered Navigation module, website visitors can find necessary products easier. The extension also enables frontend users to clear all selected filter attributes in one click with the X button. Besides, both grid and list products layout is supported, and the horizontal filter bar can be added to the pages with the one-column layout. 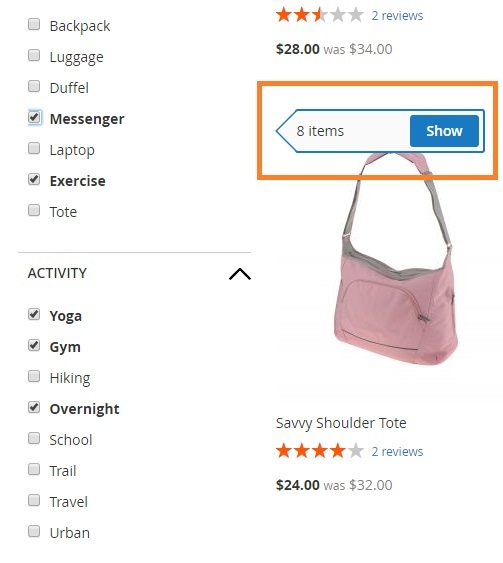 The Magento 2 Layered Navigation module also lets to enable Amazon-like single path category list style, so that customers can conveniently select sub-categories in a chosen category step by step. The module also brings all necessary improvements to the SEO of layered navigation pages. In this way, you can change URLs look; disable indexation of catalog search pages to be avoided by web crawlers; use meta title and description for search results pages; apply 301 Redirect to old search results pages; rewrite meta robots to prevent duplication of content. Using free Shop By Brand add-on, you can include brands into layered navigation as additional filtering options. It is also possible to add a brand logo and description to product pages, as well as create dedicated brand pages, thus making your online store more eye-catching and increasing customers loyalty. What is more, Layered Navigation is integrated with the Aheadworks Advanced Search module, simplifying filtering of search results for store visitors. To start configuring the module, go to Catalog -> Layered Navigation by Aheadworks -> Manage Filters. You can apply up to 7 filters to the grid’s records, sort them, and apply mass actions. To edit a specific filter, click on the one in the grid to open the Edit Filter page. Here you have two sets of settings: General Settings and Categories. In General Settings, you can change the filter title, enable/disable using it in layered navigation and search results layered navigation, and define its position within the entire set of the filters. Next, you choose the default filter state (Expanded or Collapsed) and how to sort the filters (manually; alphabetically in ascending or descending order). For the category filters, you also get an option to select a category list style: Default (multiselect) or Single path. In the Categories tab, you select categories where you want to display the filter. General settings of the module are available under Stores -> Settings -> Configuration -> Aheadworks Extensions -> Layered Navigation. In General Settings, you can enable AJAX and specify whether the extension should display three new filters or not. Activate In Stock, On Sale, and New filters to streamline the full potential of the Aheadworks Layered Navigation Magento 2 module. Here you also enable/disable “Show X Items” popover; choose whether to use price filter in the slider and from-to input format; select default filter state (expanded or collapsed); set the limit for filter values display; decide on hiding filters with null attribute values and hiding unavailable attribute values. In the SEO section, you can optimize the settings to improve your website performance for web crawlers and avoid some SEO issues. Here you can set SEO-friendly URLs, disable search engine indexation of catalog search pages, and apply 301 Redirect to old URLs. Then, set templates for the catalog page meta title and meta description, enable/disable rewriting meta robots tag, and choose if you want to add canonical URLs to search pages. Let’s see how some layered navigation features look on the frontend. On a category page, Single Path option selected for a category filter will allow customers to choose sub-categories step by step. After a customer picks an attribute, the extension can display a popover showing how many items match the selection. Then, he or she can continue selecting attributes even within a single category (the popover will be updated each time a new attribute is selected). If the item count popover is disabled, the extension will show the number of items in brackets next to each attribute. For category pages where the one-column layout is used, a horizontal filter bar can be added for improved user navigation. Horizontal Filters Bar. Horizontal filters bar can be added to the category pages, improving navigation experience. Integration with the Advanced Search Module. Customers get more simplified search results filtering. Manage Filters Page. 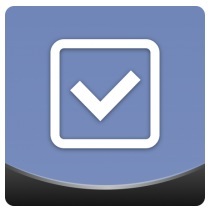 A page for filters management was added to the backend configuration. The Manage Filters grid allows admin users to sort and filter all filters options quickly. Individual Filter Editing Settings. Each filter can be configured on a separate page. Filters Attribute Sorting. Sort By option can be applied, particularly useful for products with multiple attribute values. Default Filter State. Choose to display expanded or collapsed filters. The option can be applied to an individual filter. Amazon-like Categories List Style. Categories can be displayed whether in the Default or Single Path mode. Filter Clearance. Selected filter values can be cleared in one click with X button. “Show X More” Link. The link expands all filter attributes replacing scrollbars. Option to Hide Void Filters. Filters with no available attributes can be disabled. Adaptive Price Ranges. Price ranges are automatically updated based on the price range of the filtered products. SEO Enhancements. SEO configuration field set added to the Configuration section of the Magento Admin. Admins can use the following SEO options: change the URL structure to make it more SEO-friendly; disable indexing of catalog search pages; add canonical URLs; apply 301 Redirect; set meta title and description using templates; rewrite meta robots. Active Filters Displayed in One Place. Customers can see all applied filters at the top of the results page. Shop by Brand Integration. The integration with the Shop by Brand extension allows Layered Navigation to take advantage of new product filtering and display facilities. Price Slider and From-to Inputs. The price product attribute can be filtered using either the price slider of price range fields. Disable “Show X Items” Popover. Ability to get filtering results on the go. Code and Structure Refactoring. This version of the extension gets rid of excessive and precarious code elements making extension updates and integration smooth and simple. The module is covered by unit tests. Full AJAX Support. Results of filtering are displayed using AJAX that makes data retrievement much faster and stable, even suitable for the stores containing up to 10K+ products. LESS Styles. The version starts using LESS that makes the Layered Navigation extension good and ready for Magento theme integrations. Although the default navigation of Magento 2 has been essentially enhanced in comparison with the first version of the popular ecommerce platform, there is still room for improvement. Luckily, Aheadworks has a robust tool that will help you make user experience related to navigation on your Magento 2 website much better. Let your customers find what they are looking for without reloads and unnecessary items! If you are a Magento 1 merchant, don’t hesitate to install the appropriate Magento 1 module, since the navigation on the first version of our favorite ecommerce platform requires improvements even more. As for prices, Layered Navigation for Magento 2 costs $249 with standard free installation, 90 days of support, and personal account manager included. Moreover, if you are a company’s Magento 1 client, you can ask for a 50% discount. Aheadworks also has a special offer for the Layered Navigation buyers – if you add their Advanced Search module to your purchase, you will get the latter one with 50% discount. In its turn, Magento 1 module has a lower price tag – $139, but you have to pay for installation, extended support, and additional features (brand selection).